The Great Wall of China stretches across five northern Chinese provinces and five autonomous provinces from Bohai Bay on the Yellow Sea in the east to Jiayu Pass, 1,500 miles away, in the Gobi Desert, in the west. Ranging in height from five meters to 13 meters, and up to 10 meters thick, The Great Wall is longer than the the Nile River (six Great Walls could stretch around the entire earth) and contains an estimated 400 million cubic yards of material, enough to build 120 pyramids equal in size to the Great Pyramid of Cheops, and enough to build all the buildings in Scotland and England in 1793. The most comprehensive and technologically advanced survey to date—a two-year mapping project finished in 2009, using GPS and infrared technology—determined the wall stretches for 8,851.8 kilometers and includes 6,259.6 kilometers of actual wall, 359.7 kilometers of trenches and 2,322.5 kilometers of natural barriers such as mountains and rivers. The Chinese word for the Great Wall of China has traditionally been changcheng, which literally means “long wall” or “long walls.” When it was being built the walls were known by at least ten different names The Ming usually called them bianquing (“border walls”). The term Great Wall was coined by Europeans and began to be widely used towards the end of the 19th century. Before that it was referred to by foreigners mostly as the “Chinese Wall.” Only in the 20th century after Westerners began calling it the Great Wall did the Chinese start calling it something similar: Wanli Changcheng (literally “10,000 li long wall”). Many of the claims made about the Great Wall are untrue. It is not a single wall. It did not halt the Mongol invasion. And, it cannot be seen from the moon. "Although we can see things as small as airport runways," space shuttle astronaut Jay Apt wrote in National Geographic, "the Great Wall seems to made largely of materials that have the same color as the surrounding soil. 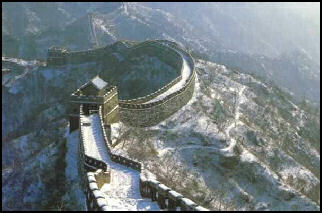 Despite persistent stories that it can be seen from the moon, the Great Wall is almost invisible from only 180 miles up!" According to a Scientific American report the Great Wall is visible only “from low orbit under a specific set of weather and lighting conditions.” Other man-made objects such as the pyramids are visible from space. The Great Wall is made of packed earth, bricks and mortar, fieldstones and quarried rock. Some sections are made of stone and have crenelated watchtowers with vaulted ceilings and arched windows. Others are little more than crumbling piles of mud brick with animal shelters carved in them. In some places it isn’t a wall at all but a string of unconnected signal towers. Most sections are made of tamped earth. Long sections run across the tops of mountains and ridge tops, incorporating natural barriers such as cliffs and steep slopes. The Great Wall has outlived its usefulness for several centuries now and until fairly recently had been left to crumble into dust. Its only real use today is as a tourist attraction. There are two main sections: the stone walls built as lines of defense around Beijing and the walls made mostly of tamped earth further to the west. The concept that the Great Wall is a continuous wall made of stone is derived largely by marrying the stone Ming walls that one sees north of Beijing, built between the 14th and 17th century, with descriptions of a 3.000 mile built in the 3rd century B.C. under Emperor Qin Shihuang. Even today its is not clear what qualifies as a section of the Great Wall and what doesn’t. Some say that a section has to be a part of a 100 kilometer long chain to qualify. Other say any border fortification can be included. A satellite survey determined there were 390 miles of walls just in the Beijing area. Field work has determined that there is much more than that. Much of the land around the wall is deforested . One reason for this is that the Imperial government decreed that all grass and trees within 100 kilometers of the wall be cleared to deprive attacking enemies of opportunities for surprise attacks. Near the wall the land was used to raise crops to feed soldiers that were stationed at the walls. On the Great Wall watchtowers, Brook Larmer wrote in Smithsonian Magazine: “They enabled troops to shelter in secure outposts on the wall itself as they awaited Mongol attacks. Even more vitally, the towers also functioned as sophisticated signaling stations, enabling the Ming army to mitigate the wall's most impressive, but daunting, feature: its staggering length. Relying on observation sites like this one, soldiers transmitted signals from the front lines back to the military command. Employing smoke by day and fire at night, they could send messages down the line at a rate of 620 miles per day—or about 26 miles per hour, faster than a man on horseback. According to Cheng Dalin, a leading authority on the wall, the signals also conveyed the degree of threat: an incursion of 100 men required one lighted beacon and a round of cannon fire, he says, while 5,000 men merited five plumes of smoke and five cannon shots. The tallest, straightest columns of smoke were produced by wolf dung, which explains why, even today, the outbreak of war is described in literary Chinese as "a rash of wolf smoke across the land." Great Wall tower At one time more than 40,000 watchtowers were strung along the Great Wall. Messages were relayed using signals made from fire, smoke, and gunpowder. The Chinese also used the wall as an elevated highway to move troops and equipment through rugged terrain. Some sections of the wall are wide enough to accommodate five horsemen or 12 armed soldiers walking abreast. Emperors sometimes led entire armies along the top of the wall. Many people live near the wall and continue to use it today. Some have their houses built into it. One family with a house with 20-foot-thick walls told National Geographic it is “very warm in the winter, cool in the summer.” Some villages are entirely enclosed in high-walled forts and have the characters for “fort,” “barracks” or “checkpoint” in their name. In other places holes have been pinched in the wall to allow sheep to pass and stones have been cannibalized as construction material and even sold to tourists at a price of $10 for one 10 kilogram stone. Early Great Wall The first sections of the Great Wall were built between 770 and 450 B.C. by small independent, often warring, kingdoms. It was first thought that the fortifications were built by small Chinese kingdoms to protect their irrigated lands along the Yangtze and Yellow rivers from steppe nomads to the north because the first walls were built roughly on a line originally thought to separate the fertile river valleys of the south from the steppe to the north. This was not always true, however. Sections of wall rose and fell with provincial states and were defined by a number of factors. The sections in present-day Hebei and Liaoning Prefectures are said to be the oldest. Beginning in 221 B.C., existing walls were linked together and reinforced under orders from Emperor Qin, the first emperor of unified China. Hundreds of thousands of workers took part in the project and perhaps tens of thousands of them died. Many were political prisoners who were sentenced to ten years of hard labor. The wall itself was made mostly from compacted earth. The 180 million cubic meters of material used now lies at core of many sections of the wall. 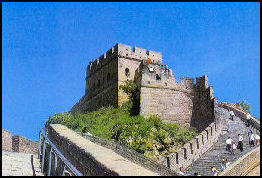 As invaders from the north became stronger the fortifications of the Great Wall of China were built up to keep them out. If the Great Wall was breached, the Chinese believed, the invaders would assimilate themselves into the Chinese way of life once they realized its "superior attractions." For over a thousand years this strategy worked. After a period of disruption, invaders usually married Chinese women and were in fact absorbed. The dynasties that ruled China for the most part took over after power struggles within the empire. 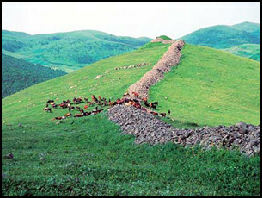 The main threat in the early years of the Great Wall came from the Hu, a horse-riding nomadic people from Central Asia. They were mentioned in records relating to the Warring States period (303-221 B.C.) and the Qin dynasty (221-207 B.C.). The Hu had no interest in assimilation and easily skirted the wall. Subsequent dynasties continued to rebuild and restore the walls, and occasionally criminals and political prisoners were thrown threw the gates and left to survive on their own in the north. During the Han dynasty so many trees were felled for scaffolding an ecological disaster occurred. The Tang dynasty kept the barbarians at bay by encouraging trade and cultural exchanges rather than building walls. In the 13th century, the walls failed to stop Genghis Khan, who reportedly said, "the strength of the wall depends on the courage of those who defend it." He reportedly breached it by bribing a sentry. The most famous and impressive sections of the Great Wall were built from mud, brick and stone during the Ming Dynasty (1368-1644). The Ming emperors devoted a huge amount of resources and manpower to the project. Stones weighing over a ton were shaped, moved and heaved on top of each other. Over 60 million tons of bricks and stone slabs were used. The Ming built their walls as lines of defense with as many as four rows of fortifications in strategic areas. They used durable materials and construction methods, intending to make something that lasted. Stone was quarried in the Beijing area. The mud bricks were made of soil, straw, tamarisk, egg yolk and rice paste. The earth was tamped with large chunks of rock and special tools. The project took over a 100 years to complete. At one time, nearly one in every three males in China was conscripted to help build it. Towns along the wall became industrial areas for firing bricks, blasting rocks to make fill and sharpening stones. Army units were put to work on a rotating basis so no one unit would be overworked and rebel. The towers and walls were often made separately with the towers being made first from brick that was carried in. Wall sections were built between the towers, first with local stone, and later with materials that were carried in. Construction was usually done in the spring when the weather was good but the Mongols were not active (they usually raided and attacked in the fall after their horses had been fattened up on summer grass). In some places tablets identify when a given wall section was built and name the officials involved in building it. Many people who live around the Great Wall today, especially in the hills northeast of Beijing, claim to be descendants of soldiers that were stationed on the wall. Many of these trace their roots back to a policy in the mid 1550s that aimed to prevent soldiers firm deserting by allowing their wives and families to move into the watchtowers with them. Some of the towers bear the same surnames of the families that live in nearby villages. While many scholars say that the Great Wall was no better than the Maginot line which failed to stop the Nazis from entering France, others say it served its purpose well. In the early years of the Ming dynasty the Chinese military often went on the offensive and pushed Mongol settlements away from the walls. Later the Chinese bribed Mongol leaders or set up lucrative trade opportunities to keep them from attacking. Many sections of the wall were built in the late Ming era when the Ming army was too weak to fight and the emperors were too proud to negotiate. 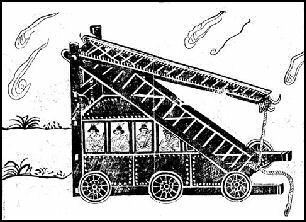 In a typical defense the Chinese used crude cannons, arrows cudgels and stones to defend against Mongol attacks. There were regulations about how many stones could used in a defense and how they would be carried to the wall. In some sections you can still see piles of stones ready to be used in the next attack. The Mongols liked to approach the walls at night on horseback, in small groups. They followed ridge lines because they were concerned about ambushes. They were not interested in occupying land. They were raiders, who penetrated into Chinese territory and returned as quickly as possible. Often their objective was to steal livestock, valuables and Chinese people, who were forced into families, with the men trained to be spies behind Chinese lines while their wives and children stayed in Mongolia as hostages. wall-mounting devise A major attack occurred in 1550 when the Mongols breached a crude section of stone wall and pillaged for two weeks, killing and capturing thousands of Chinese. After that more sturdy walls made with mortar were built. During the attack by Mongols around Jinshanling in October 1554, one document reported, a battle raged for two hours between 11:00am and 1:00pm. The Mongols used ropes to climb the walls. Chinese repelled them using arrows, crude cannons, clubs and even rocks. One Chinese soldier hacked off the hand of an attacker only to be killed moments later by an enemy arrow that pierced his head. In 1576 there was another major Mongol attack. This time they penetrated through an area so rugged and remote building a wall was not considered necessary. During this raid the Mongols killed an estimated 20,000 Chinese. Another major campaign of wall building followed. After that the Chinese for the most were able to hold back the Mongols. 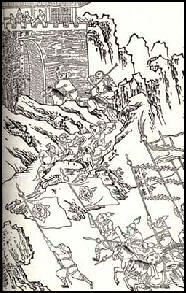 At Shuitou, the Chinese withstood an attack by thousands of Mongols. The invading Tatars broke through the Great Wall in 1550 and the Manchus poured through uncontested in 1644. Only about a third of the Ming Dynasty wall remains intact. Because of the high quality of the construction, some wall sections today look pretty much as it did in the Ming Dynasty. After the Ming dynasty collapsed, Chinese intellectuals tended to see the Great Wall as huge waste of money and live. The Qing Dynasty let the walls deteriorate, in part because they were Manchu horsemen which the walls had been designed to keep out, plus they controlled territory far north of the wall. Into the 20th century the Great Wall was held in relatively low regard and was only given a boost when China needed a dose of nationalism to raise its esteem during bad times. Both Sun Yat-sen and Mao Zedong used the wall as symbols of Chinese strength, pride, hard work and greatness. The Great Wall deteriorated under Mao. Peasants took tamped earth to patch their fields and grabbed stones to to build houses. In some places caves were dug into the wall to live in and store stuff. In other places stones were pried off by scorpion hunters looking for their prey. When asked what happened to missing sections many villagers will tell you they were dismantled to keep the Japanese from using them as observation posts and machine gun nests. During the Cultural Revolution in the early 1970s large parts of the wall were torn down by crowds chanting, "Down with the Four Olds" to make barracks and houses. After the Cultural Revolution ended some sections were reportedly rebuilt by the same people who tore them down. A Deng Xiaoping era slogan went: "Let us love our China and restore our Great Wall!" In recent years the Great Wall has become quite popular. There are Great Wall tires, Great Wall wine, Great Wall cigarettes, Great Wall rockets and Great Wall computers. “This new method of taxation levied on acreage may be linked to the rise of large-scale public works, such as the building of dams, canals, and state walls (the greatest of these ultimately being linked as the Great Wall of China). During the centuries of the late Spring and Autumn and early Warring States periods, iron technology was first applied to agriculture; along with new developments in irrigation and planting techniques, this greatly increased productivity. Under these conditions, estate holders would have found that the principal traditional form of tax, labor due on patrician fields, was not so efficient as a tax on personal crop yields plus labor time, directed no longer to the lord’s crops, but instead to public works. The economic and military benefits of these works became increasingly critical during the Warring States period, when competition among states drove governments towards increased size, aggressiveness, and public control.